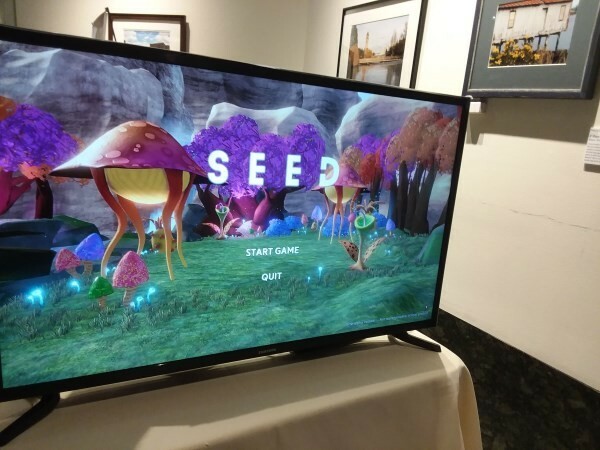 On Saturday, V.o.lynn got the chance to chat with Derek DeLizo, Lead designer for Digital Future Lab, and Megan Smart, one of the 3D Animators for their upcoming game “Seed”. The game that they’re most excited about, though, is Seed. “It’s a reverse tower defense game,” Derek explained. “Instead of trying to kill the characters, you’re trying to save them and help them reach the end.” This is Digital Future Lab’s first 3d design attempt, and they’re attacking it with gusto. The gameplay is fun and still in beta, with the adorable “Tali” (Pokemon-esque critters with lifespan timers) walking a path from one end of a maze to another, with little life-force boosters that are set by the all-knowing (and fallible) player. “With the 3d design in Seed, it was a new jump for us. We were building layouts, but we never really found a core mechanic that said ‘this makes SEED fun’. Jason Pace helped focus on system design.” With Seed, they had to think differently about it – working from the inside out, with the solution in mind. At its core, Tower Defense is a puzzle game – stop them all from getting to the end. Also, unlike some mobile platformers, SEED isn’t going to be built for microtransactions for “boosters” – puzzles can be solved with the powers given. As DFL’s lead designer at the moment was mostly in bug catching (playtesting), the knowledge of learning a game inside out was the best carryover from Ghostlight into Seed. Digital Future Labs really seem to keep the focus being a positive platform for creative puzzle play for all ages.